Solar water heating systems provide an efficient way to meet hot water loads in most climates. Unlike photovoltaic systems that generate electricity, most solar water heating systems directly heat fluids using solar energy. Fluid flows through outdoor solar thermal collectors where it is warmed by the sun. 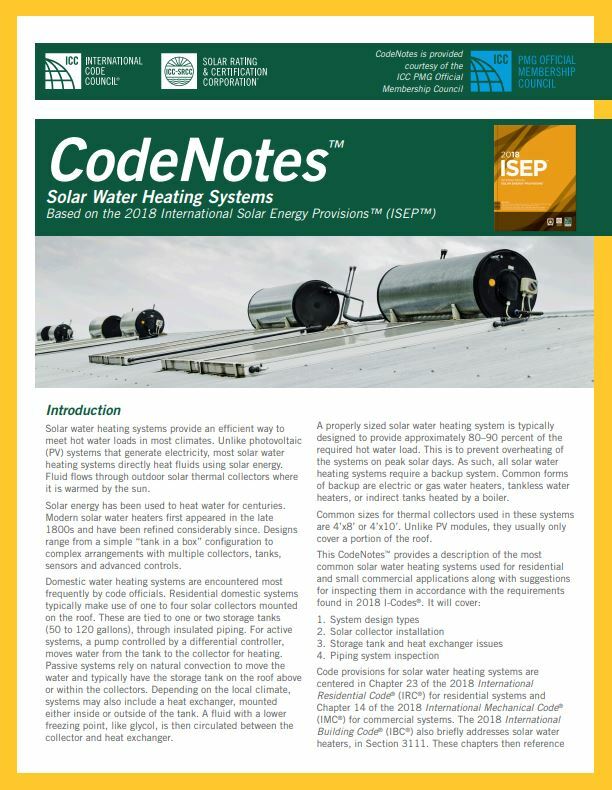 This CodeNotes — Solar Water Heating Systems (based on the 2018 ISEP) — provides a description of the most common solar water heating systems used for residential and small commercial applications along with suggestions for inspecting them in accordance with the requirements found in the 2018 International Codes. Solar energy has been used to heat water for centuries. Modern solar water heaters first appeared in the late 1800s and have been refined considerably since. Designs range from a simple “tank in a box” configuration to complex arrangements with multiple collectors, tanks, sensors and advanced controls. 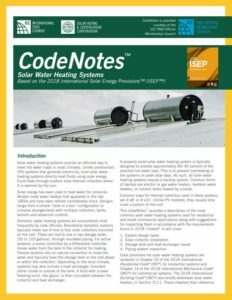 A new edition of CodeNotes — Solar Water Heating Systems (based on the 2018 International Solar Energy Provisions) — provides a description of the most common solar water heating systems used for residential and small commercial applications along with suggestions for inspecting them in accordance with the requirements found in 2018 International Codes. 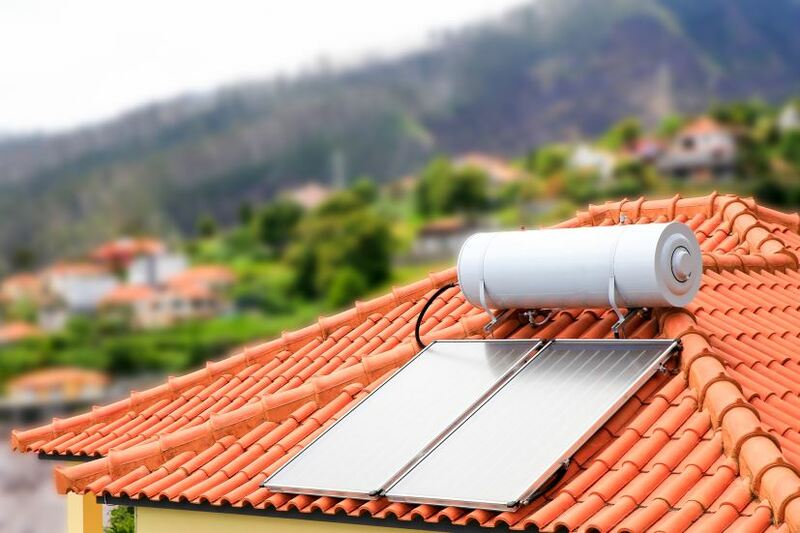 Code provisions for solar water heating systems are centered in Chapter 23 of the 2018 International Residential Code (IRC) for residential systems and Chapter 14 of the 2018 International Mechanical Code (IMC) for commercial systems. The 2018 International Building Code (IBC) also briefly addresses solar water heaters in Section 3111. These chapters then reference other provisions elsewhere in the IRC, IBC, International Plumbing Code, International Fire Code and International Energy Conservation Code. The IRC, IMC and IBC reference and require compliance with the ICC 901/SRCC 100 Solar Thermal Collector Standard and ICC 900/SRCC 300 Solar Thermal System Standard that provide other significant details. Certification is available from certification bodies like the Solar Rating and Certification Corporation (ICC-SRCC) to demonstrate compliance with these standards. For ease of access to these widespread provisions, the International Code Council published the International Solar Energy Provisions (ISEP), which contain a complete listing of all provisions for solar thermal and photovoltaic systems within the full family of 2018 International Codes, the 2017 National Electrical Code from the National Fire Protection Association, and the standards ICC 901/SRCC 100 and ICC 900/SRCC 300. Solar thermal systems touch many building parts and systems, including roofing, structural, plumbing, mechanical and electrical. They also involve unique components, elevation and outdoor exposures that make their inspection a challenge. The Solar Water Heating Systems CodeNotes lists some specific considerations when inspecting solar thermal water heaters. The specific areas considered include collector location and orientation, structural mounting of collectors, penetrations, access, storage tanks and auxiliary water heaters, heat exchangers and heat transfer fluids, pipe insulation, safety devices, piping, service connections, isolation valves, pumps and controls, and proper system operation. It is not exhaustive and users should consult the 2018 ISEP for all relevant codes and standards. To learn more about what codes address solar water heating systems, how solar water heating systems are approved and the applicable use of solar water heating systems, click here to read the entire CodeNotes. Online classes and webinars supplementing this publication are also available. As part of its goal to serve the needs of plumbing, mechanical and fuel gas (PMG) officials, the ICC PMG Official Membership Council is committed to providing free, informative code support documents known as CodesNotes that can be used to complement building departments’ in-house weekly supplemental training. We hope you enjoy this newest edition of CodeNotes. Past topics include backflow devices and the protection of the water supply, gas pipe sizing based on the latest edition of the International Fuel Gas Code and the International Residential Code, and bonding of corrugated stainless steel tubing gas piping systems, just to name a few. The CodesNotes collection has recently been expanded to include a selection of notes offered in Spanish. The ICC PMG Official Membership Council website offers many resources. 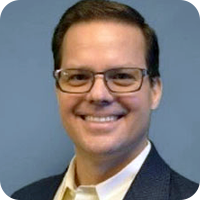 The council — open to all ICC members and serving the needs of PMG officials and industry professionals — consists of a great team of professionals who are willing to share their technical expertise and experiences. You’ll have the opportunity to discuss issues that you face as a community, and how ICC might best serve you. If you haven’t already done so, please go online and become a member of the PMG Official Membership Council.